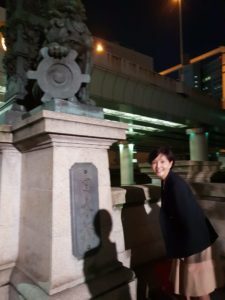 Editor’s note; In the evening, both the Philippine guests went to the Nihonbashi , “The Road Origin Marker of Japan “, the starting point of roads since the Edo period. Because they are working on a lot of transportation infrastructure related projects, they were very interested in it. Of course I am also. I thank my mentor for taking us there and kind guidance.